Summer is here in all of it’s warm and delicious glory and we can’t get enough (our use enough) of fresh fruit and veggies! Our vegetable garden is growing like crazy (making a constant supply of kale) and BC peaches and apricots are ripe and in full swing. So, we’re making the most of it. We love stone fruits, especially peaches and apricots. Not only are they great on their own, but they are fabulous on salad. Our friends at Woolrich Dairy were kind enough to send us some amazing goat cheese and we had to take full advantage. It was the perfect opportunity to blend the creamy, tangy goat cheese with the sharp sweetness of ripe fruit. Their Chevrai crumble is a perfect addition to a bright summer salad. Really, can you ever go wrong adding goat cheese to a salad? We’re pretty sure the correct answer is no. Need help knowing when it’s the right time to try this salad out? We can help with that too. Try enjoying this salad on a hot summer day, paired smartly a cold Big Rock Belly Flop. It’s crisp, refreshing and has just a a touch of sweetness, a wonderful compliment. So grab your salad spinner and your shades, it’s time to enjoy summer. *To help reduce the bitterness of the kale, toss the kale with the olive oil and balsamic vinegar and let it sit for half an hour before adding the other salad ingredients. Alternatively, if kale isn’t your favourite, try substituting another favourite lettuce like spinach. **These pecans are even tastier toasted! 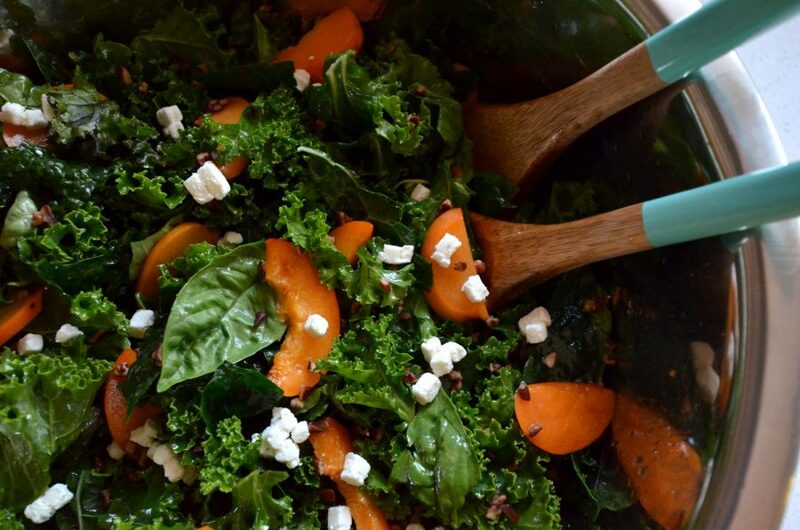 In a large bowl, toss the kale, basil, peaches, apricots, pecans and goat cheese. In a small bowl, mix the olive oil and balsamic vinegar. Toss over the salad and mix until the leaves are covered.